It’s always around this time of year when I start to feel a little restless. The novelty of hibernation mode is wearing off and I feel like I’ve exhausted the many different ways of making stew. The weather has been mild here lately and although I know that spring is still months away, it’s refreshing to feel the warmth of the sun. I haven’t spent nearly enough time outside this winter and I can feel that slowly weighing on me, the urge to get outside, to feel the wind on my cheeks, to breathe – it’s a strong pull these days. Matt’s home now and we’ve spent some more time outside, snowshoeing and skiing and getting out of the city. It feels so good to be up to our old adventures again. Productivity behind the computer has been on an ultimate low as of late and I’m ok with that. I’m a firm believer that a little time away will only inspire the work to be done, so that’s what I’m going for. On the note of inspiring work, my dear friend Shelley has launched an etsy shop and her adorable tea towels are just the beginning of something really great. Do check it out. Friends out there doing what they love, creativity is just so rad. There’s a lot to be said about good salads during the winter, something interesting and bright that leaves you feeling satisfied. Spices and some good roasted veg make all the difference for me. A new dressing can help mix things up too. Something that keeps in the fridge for lunches and lazy movie nights is also a requirement. This one checks all the boxes, plus a little color always goes a long way – so here is a little splash of pink to fight away any of those winter blues. The components of this dish are as good on their own as they are together. The recipe for dukkah will leave you with lots left over, I like to keep it in a mason jar with my other spices. I add it to salads and veggies throughout the week as a little something extra, I’m loving it on roasted fennel right now. The creamy dressing is almost caesar-esque, and can used for any salad you like, the addition of some nutritional yeast wouldn’t be a bad idea. I used canned white beans for the dressing and just threw the remaining beans right into the salad. Any greens will do and if you’re not a fan of bitter winter leaves simply omit the radicchio. I do love how it acts as a salad scoop though. Just use what you like and leave what you don’t and let your own creativity do it’s thing. Vegan + Gluten Free. Serves 3-4 as a main, more as a side. Peel the beets and slice in half. 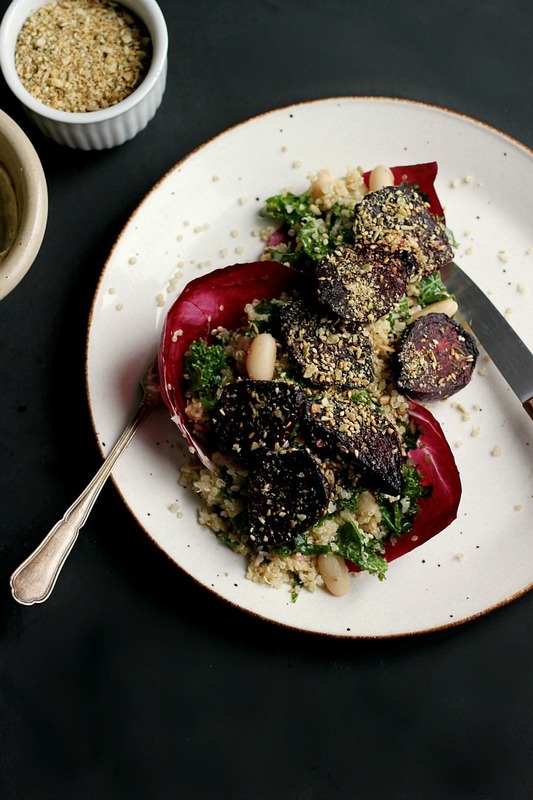 Place beets and garlic cloves on a rimmed baking sheet lined with parchment. Drizzle with olive oil and sprinkle with salt, toss to evenly coat. Roast in the oven until tender and easily pierced with a knife, about 35-45 minutes depending on the size of your beets. While the beets are roasting, prep the other ingredients. Rinse the quinoa under cold water in a metal sieve for about 30 secs. Add rinsed quinoa and 2 cups of water to a pot and season with salt. Bring to a boil, then cover and simmer for 15 minutes, until quinoa has increased in sized and absorbed most of the water. Remove from heat and let sit with the lid on for another 5 minutes before fluffing with a fork. 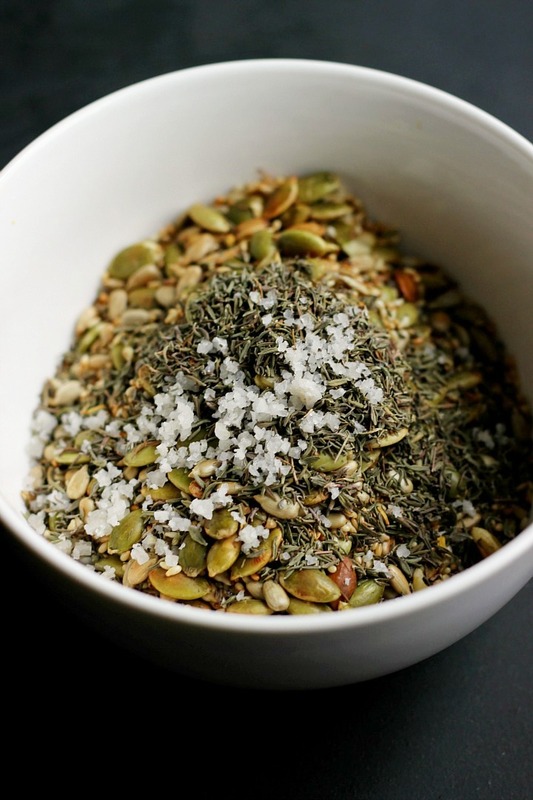 Make the dukkah. Place everything but thyme and salt in a small dry skillet over medium heat. Toast until brown and fragrant, about three minutes, stirring often. Let cool then pulse in a small blender with thyme and salt until just broken up, leaving some seeds whole. 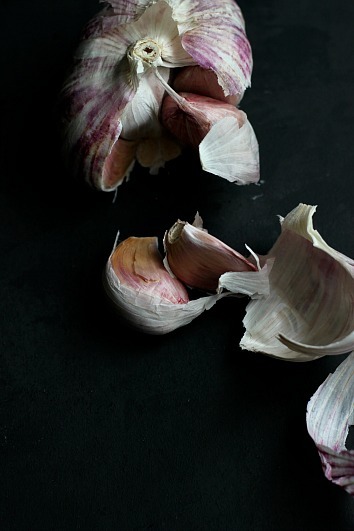 For the dressing you’ll need the roasted garlic from the oven. You can wait until the beets are done, or remove just the garlic if it feels soft. 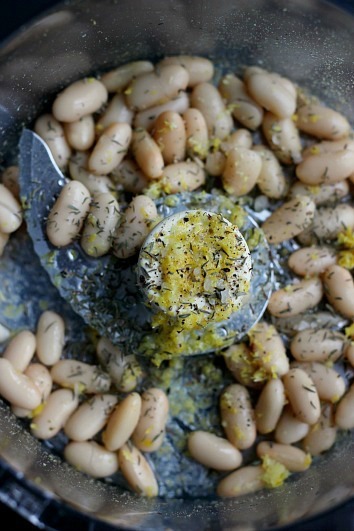 Place beans, thyme, roasted garlic, lemon juice + zest in a blender or food processor. With the motor running, drizzle in olive oil and combine until smooth. Adding water, as needed, to thin it out for easy tossing. Add a pinch of sea salt and a good dose of black pepper, blend and adjust seasoning if needed. Dressing can be kept in the fridge in a sealed jar. Remove the stalks from the kale and thinly slice the leaves. 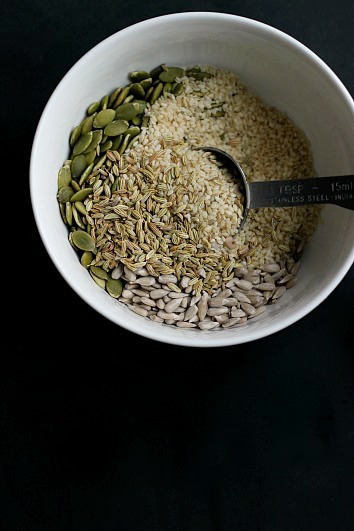 Place in a bowl and drizzle with a little bit of olive oil and a pinch of salt. Massage with the tips of your fingers until the leaves have softened and deepen in color. Add cooked quinoa and leftover beans if using. 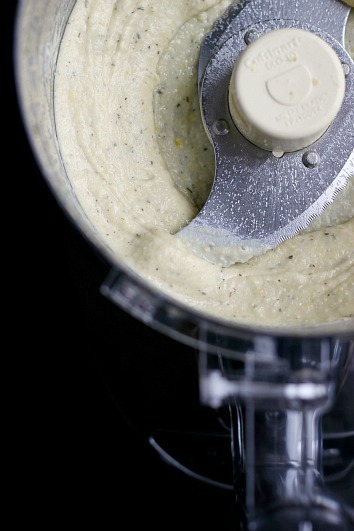 Add a few spoonfuls of dressing and toss to combine. Arrange a few radicchio leaves on a plate and top with creamy quinoa kale mixture. 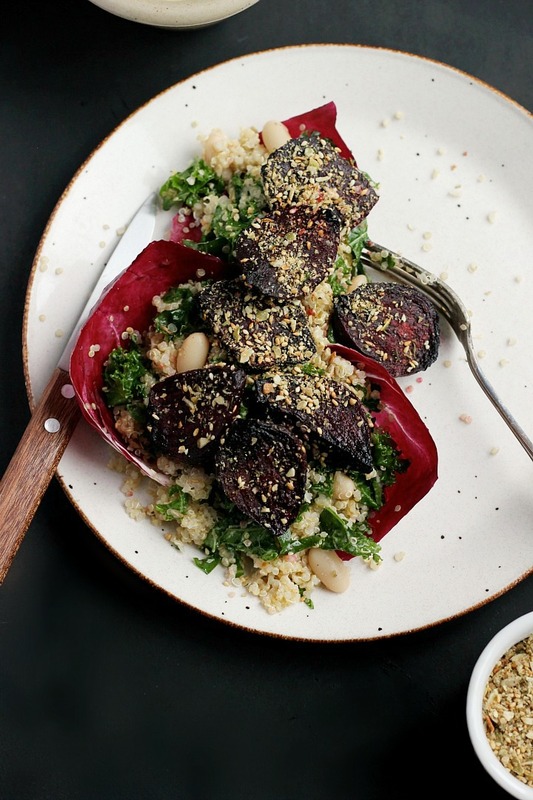 Place roasted beets on top and sprinkle with dukkah. Serve with extra dressing + dukkah on the side. dearest jodi, i am so ever in love with this salad. the beets are sincerely the color of my heart when i come to think about winter salads. they always seems such a far cry into the bleak days (my restlessness is growing old), but winter salads are the perfect template for creativity and passion. beautiful, i wish you and yours well in these wintry days. Beautiful, Jodi! 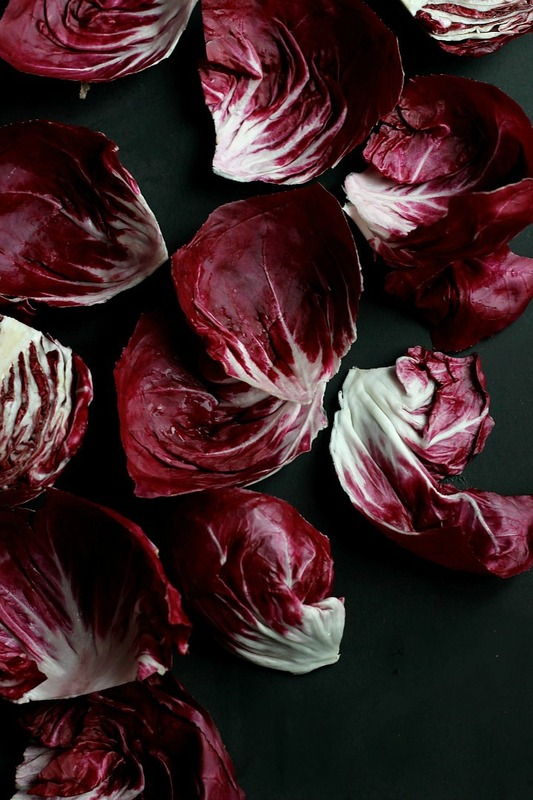 I love the white beans in the dressing, and I really love the presentation in radicchio cups. This is beautiful! I can completely relate to feeling like you haven’t been outdoors enough – and I feel like my limited access to natural light is really throwing off my sleep cycle too. If only this unseasonably warm weather meant that spring was coming sooner!